Palestinians and Israelis watched last week’s referendum of Iraq’s Kurds with special interest. Israeli officials and many ordinary Palestinians were delighted – for very different reasons – to see an overwhelming vote to split away from Iraq. Given the backlash from Baghdad and anger from Iran and Turkey, which have restive Kurdish minorities, the creation of a Kurdistan in northern Iraq may not happen soon. Palestinian support for the Kurds is not difficult to understand. Palestinians, too, were overlooked when Britain and France carved up the Middle East into states a century ago. Like the Kurds, Palestinians have found themselves trapped in different territories, oppressed by their overlords. Israel’s complex interests in Kurdish independence are harder to unravel. Prime minister Benjamin Netanyahu was the sole world leader to back Kurdish independence, and other politicians spoke of the Kurds’ “moral right” to a state. None saw how uneasily that sat with their approach to the Palestinian case. On a superficial level, Israel would gain because the Kurds sit on plentiful oil. Unlike the Arab states and Iran, they are keen to sell to Israel. But the reasons for Israeli support run deeper. There has been co-operation, much of it secret, between Israel and the Kurds for decades. Israeli media lapped up tributes from now-retired generals who trained the Kurds from the 1960s. Those connections have not been forgotten or ended. 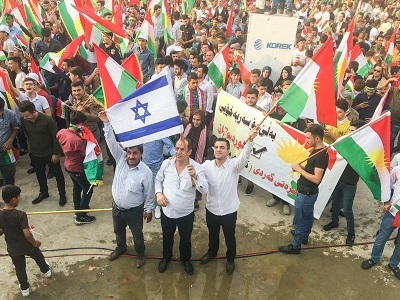 Independence rallies featured Israeli flags, and Kurds spoke of their ambition to become a “second Israel”. Israel views the Kurds as a key ally in an Arab-dominated region. Now, with Islamic State’s influence receding, an independent Kurdistan could help prevent Iran filling the void. Israel wants a bulwark against Iran transferring its weapons, intelligence and know-how to Shiite allies in Syria and Lebanon. Israel’s current interests, however, hint at a larger vision it has long harbored for the region – and one I set out at length in my book Israel and the Clash of Civilizations. It began with Israel’s founding father, David Ben Gurion, who devised a strategy of “allying with the periphery” – building military ties to non-Arab states like Turkey, Ethiopia, India and Iran, then ruled by the shahs. The goal was to help Israel to break out of its regional isolation and contain an Arab nationalism led by Egypt’s Gamal Abdel Nasser. Israeli general Ariel Sharon expanded this security doctrine in the early 1980s, calling for Israel to become an imperial power in the Middle East. Israel would ensure that it alone in the region possessed nuclear weapons, making it indispensable to the US. Sharon was not explicit about how Israel’s empire could be realized, but an indication was provided at around the same time in the Yinon Plan, written for the World Zionist Organisation by a former Israeli foreign ministry official. 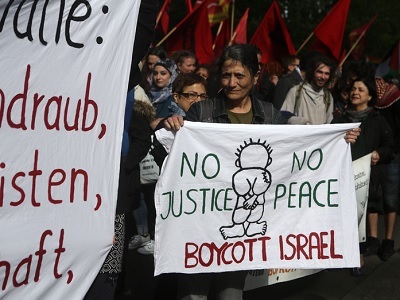 Oded Yinon proposed the implosion of the Middle East, breaking apart the region’s key states – and Israel’s main opponents – by fuelling sectarian and ethnic discord. The aim was to fracture these states, weakening them so that Israel could secure its place as sole regional power. The inspiration for this idea lay in the occupied territories, where Israel had contained Palestinians in a series of separate enclaves. Later, Israel would terminally divide the Palestinian national movement, nurturing an Islamist extremism that coalesced into Hamas and Islamic Jihad. In this period, Israel also tested its ideas in neighboring southern Lebanon, which it occupied for two decades. There, its presence further stoked sectarian tensions between Christians, Druze, Sunni and Shiite Muslims. The strategy of “Balkanising” the Middle East found favor in the US among a group of hawkish policymakers, known as neoconservatives, who came to prominence during George W Bush’s presidency. Heavily influenced by Israel, they promoted the idea of “rolling back” key states, especially Iraq, Iran and Syria, which were opposed to Israeli-US dominance in the region. They prioritized ousting Saddam Hussein, who had fired missiles on Israel during the 1991 Gulf war. Although often assumed to be an unfortunate side effect of the 2003 invasion of Iraq, Washington’s oversight of the country’s bloody disintegration into Sunni, Shiite and Kurdish fiefdoms looked suspiciously intentional. Now, Iraqi Kurds are close to making that break-up permanent. Syria has gone a similar way, mired in convulsive fighting that has left its ruler impotent. And Tehran is, again, the target of efforts by Israel and its allies in the US to tear up the 2015 nuclear accord, backing Iran into a corner. Arab, Baluchi, Kurdish and Azeri minorities there may be ripe for stirring up. Last month at the Herzliya conference, an annual jamboree for Israel’s security establishment, justice minister Ayelet Shaked called for a Kurdish state. She has stated that it would be integral to Israeli efforts to “reshape” the Middle East. The unraveling of Britain and France’s map of the region would likely lead to chaos of the kind that a strong, nuclear-armed Israel, with backing from Washington, could richly exploit. Not least, yet more bedlam would push the Palestinian cause even further down the international community’s list of priorities. Cook is completely wrong. Kurds want to be free because of dealing with Arab, Turkish and Iranian oppressors of Kurds. Only Cook could try to say Kurds want to be free cause of Israel. 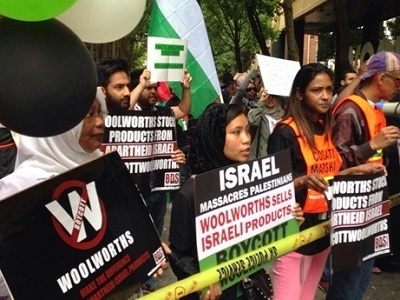 Is there anything on the Planet that Islamists and Cook don’t blame on Israel?